Redefining Diversity and Dynamics of Natural Resources Management in Southeast Asia, Volumes 1-4 brings together scientific research and policy issues across various topographical areas in Asia to provide a comprehensive overview of the issues facing this region. 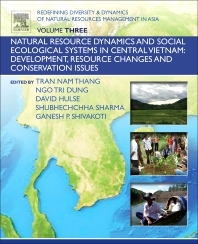 Natural Resource Dynamics and Social Ecological Systems in Central Vietnam: Development, Resource Changes and Conservation Issues, Volume 3, focuses on the issues specific to Central Vietnam that are also found globally. War had significantly impacted both land and water resources, from which it had to recover environmentally. Additionally, this is an area with growing urbanization pressures and industrial development, both of which are known for stretching resources beyond their limits. The introduction of several hydro-electric power projects have even further eroded the local agricultural and forest ecosystems. This volume looks at Central Vietnam holistically, from management and use to policy and data-driven solutions. Chapter 14: Is Vietnam Legally Set for REDD+? Ganesh Shivakoti is currently Visiting Professor at the University of Tokyo and he is also Adjunct Professor of Agricultural and Natural resources Management at the Asian Institute of Technology. Since receiving his PhD from Michigan State University and completing his Post-Doc at Indiana University, Dr Shivakoti has been extremely active in the field of resource management. He has earlier authored and edited several books published by Sage India, Edward Elgar, Chelthenham and ICS Press, California together with Nobel Laureate Elinor Ostrom. He is a member of many organizations, including IWRA, the South Asia Network on Development and Environmental Economics as well as South-East Asia Network on Sustainable Upland Natural Resources Management. He has 90 peer reviewed journal articles and has graduated 29 doctoral students from 14 countries of S and SE Asia. Mr Hulse has developed significant experience in global conservation efforts since earning his Master of Public Policy in International Development from the JFK School of Government at Harvard. His experience includes evaluating economic, environmental and social impcts of field projects on rural populations, developed and managed a number of conservation programs for WWF, program officer for work in APAC for The John D. and Catherine T. MacArthur Foundation and most currently overseeing all operations and grant-making programs of the Ford Foundation in Vietnam and now Indonesia. Ms. Shubhechchha Sharma currently works for the Hariyo Ban Program at WWF- Nepal, since receiving her Masters in Natural Resource Management. Her experience is in development and research related to community based climate change adaptation, biodiversity management and food security. She is actively engaged with regional CBOs and NGOs, helping in implementing and assessing initiatives in relation to biodiversity conservation and climate change adaptation.